Merkel said Britain and France's plans to phase out internal combustion-driven cars by 2040 "were the right approach." 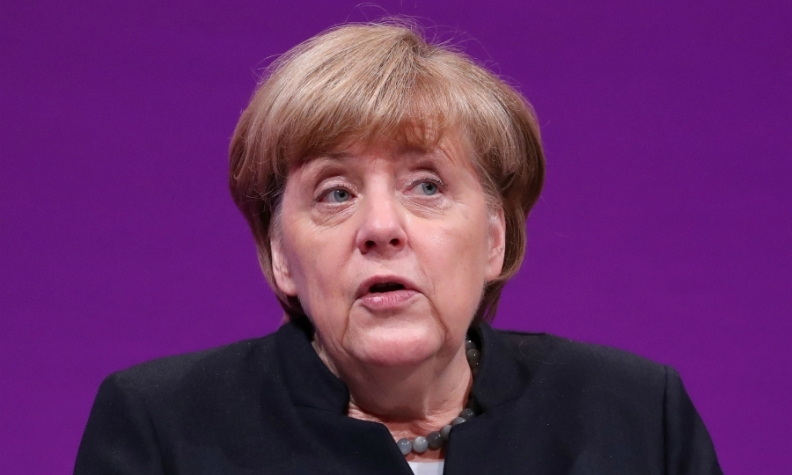 BERLIN -- Germany must eventually follow other European countries in banning the sale of new gasoline and diesel cars, Chancellor Angela Merkel said. It is the first time she has conceded that the internal combustion engine's days are numbered in Europe's biggest market, which has been stung by emissions-cheating scandals. Her concession, in an interview with SUPERillu magazine, followed mounting pressure over the summer on Germany's automakers who concealed from regulators the true emissions level of diesel vehicles. "I don't want to name an exact year," she said, but Britain and France's plans to phase out internal combustion-driven cars by 2040 "were the right approach." The fate of the auto sector, Germany's biggest exporter and provider of some 800,000 jobs, has become a hot issue in the Sept. 24 election, when Merkel is seeking a fourth term. Politicians are accusing auto executives of failing to find an adequate response to the emissions scandal. Agreement was reached at a summit of politicians and carmakers this month to overhaul engine software on 5.3 million diesel cars to cut pollution and repair the industry's reputation, battered by Volkswagen Group's admission two years ago that it had cheated emission tests. On the possibility of a second diesel summit, Daimler said: "We were and are always prepared to engage in a constructive dialogue." A spokesman for Volkswagen pointed to the carmaker's strategy of restructuring called "Together 2025", adding: "We're addressing the issues of the future." The Volkswagen spokesman also rejected suggestions that the decisions made at the diesel summit were insufficient, saying: "We think the measures are appropriate to avoid driving bans and to improve the air quality." Ministers and government spokespeople had declined to commit to phasing out diesel cars. That was in August, when Merkel was on holiday in the Italian Alps. Her absence drew criticism from her predecessor, Gerhard Schroeder, who said he would have returned from vacation to "take matters in hand." Returning to a theme she aired in Dortmund during the weekend, Merkel said the car industry must win back trust, including by offering trade-in bonuses and software updates. Consumers had been "deceived" and must get the environmental emissions performance they had been promised, she said. But tax breaks favoring diesel cars would remain in place for the time being, since they emitted less carbon dioxide than petrol engines, she said. Speaking at an election campaign rally in the western town of Gelnhausen, Merkel said it was important to acknowledge German carmakers had made mistakes. But she said employees were not to blame and it was important to preserve their jobs and ensure the industry's strength. "The auto industry needs to ensure that the mistakes that were made are corrected," she said, and the diesel summit was the first step in doing this. "But the second is that the country, the government needs to ensure that those who bought cars in good faith are not punished in the end with driving bans," she said. Merkel said diesel cars were necessary to keep pollution under control and Germany needed to support the auto industry's transformation by promoting new technologies and ensuring the infrastructure was available. "We need to organize a smooth transition into the new era so that people keep their jobs. That is the challenge that the CDU and CSU will meet," she said, referring to her Christian Democrats (CDU) and their Bavarian sister party - the Christian Social Union (CSU). Merkel said her CDU would take a "measured" approach rather than an "extreme" one. Though Germany's giant car industry has contributed to a stellar economic performance that looks likely to get Merkel re-elected, its automakers have been slower than rivals to make the shift to electric traction.